Last week I was interviewed by Cameradojo.com about my adventure sports photography and what it takes to photograph adventure sports in general. As usual I delved into the nitty-gritty details of my profession in this hour long conversation with Kerry Garrison and David Esquire. Check it out on their website, it is Podcast #59 - A Conversation with Michael Clark. * includes in the field instruction, entrance fees, presentations, digital review sessions, an Mpix photo book and transportation to each shooting location. Pack your camera gear and join the Mentor Series as we trek to the birthplace of “life, liberty and the pursuit of happiness” this coming fall! Philadelphia will provide the perfect backdrop to learn the rewards of using light to create an intentional effect in your photos, as well as explore the history and culture this city has to offer. Follow Nikon professional photographers and illumination gurus David Tejada and Michael Clark as they simplify various techniques and help you address lighting scenarios that will convey a desired atmosphere, while capturing unique images in both controlled and spontaneous shooting situations. *NEW* This trek includes a Master Class on Lighting, providing an exclusive opportunity to determine how luminosity can shape the mood and color of the photographs you create. Allow our mentors to assist you in finding the best angles, interpreting natural light sources, utilizing reflectors, and understanding how to control light. By learning how to properly use light modifiers such as umbrellas, soft boxes, snoots, grids, silks and even bounce techniques, you will walk away with a solid comprehension of how easily an image can be enhanced. Visit the stunning Longwood Gardens, one of the world’s premiere horticultural display gardens, as you gain experience directing hired models and practice using off-camera flash. Or reveal the beauty of the yellow, orange and purple trees, and the golden honey locusts, scarlet sweet gums, and ruby northern red oaks in the sunlight. Inside the Conservatory, have your camera handy as you discover a lush world of exotic flowers, with more then 20,000 blooming chrysanthemums, making for spectacular macro images. Travel on to the infamous Eastern State Penitentiary, and explore what lighting is best suited to subject and scene, as we use America’s most historic prison (open from 1829 to 1971) to shoot models and further practice learned techniques “on location”. Take advantage of the penitentiary’s vaulted, sky-lit cells to capture a particular mood in the jail that held some of America’s most notorious criminals, including Al Capone. Later, photograph along a tour of Philadelphia’s remarkable landmarks from the top of our own double-decker bus. Try your hand at making long exposure night images while you capture the Betsy Ross Bridge, the dramatic city skyline from Camden and visit the waterfront area of Penns Landing, and Boathouse Row. This promises to be a great workshop. For more information on the workshop and to register click here. Here is another link where you can also download the workshop itinerary. You can also download the workshop announcement ad. 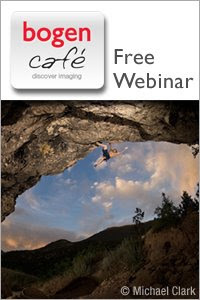 Bogen will conduct a webinar with me on July 17, 2009 talking about my experiences as an adventure sports photographer. The webinar is an interactive interview with Bogen Product manager David Fisher, where participants will be able to listen in on the interview, ask questions and get answers and are also eligible to win one of three Gitzo Traveler Series 2 Carbon Fiber 6X Monopods. For more information about the webinar click here to go to the Bogen Website. If you would like to sign up for the webinar you can Register here! - What it takes to be a pro! Bogen Imaging, which is the US supplier for such great gear as Elinchrom strobes, Gitzo and Bogen Tripods, Avenger Light stands and many other fine products, has been an imaging partner for a number of years now. This should be a very exciting and informative webinar that I think many will find very interesting.